Former Scottish footballer, Denis Law, was born on February 24, 1940. He started his career at a second division football team, Huddersfield Town F.C. in 1956. Four years later the British club, Manchester City, signed him on a transfer fees of £55,000. One year later he caught the eye of an Italian club, Torino, and was transferred at a fee of £110,000. Despite his skills and reputation on field he found it rather difficult to settle in Italy so in 1962 he signed with Manchester United. Law has made a total of 657 appearances with an accumulated 333 goals in his entire career. He also represented Scotland at the 1974 FIFA World Cup. He was also given nicknames on the playing field like “The King”, “The Lawman” and “Denis the Menace”. Denis Law, after retiring, has worked on radio and television to summarize and analyze games. On February 23, 2002, a statue of Denis Law was erected at Old Trafford. Denis was born in Aberdeen, Scotland to George Law, who was a fisherman and Robina. Denis was the youngest of his six siblings. His family wasn’t well off, they lived in a council flat in Aberdeen, he was barefoot till the age of 12 and wore hand me down shoes later. When he was in his teens his neighbor gave him a pair of second hand football boots on his birthday. He didn’t attend the Aberdeen Grammar School because there he would’ve had to play rugby instead of football so he attended the Powis Academy, now known as St. Machar Academy, and excelled on field and was selected for Scotland Schoolboys. When Law was 15 years old, Archie Beattie, in the 1954-55 season, invited him for a trial for Huddersfield town. The manager showed concern towards the young Denis Law but on April 3, 1955 they signed him. He went through an operation to correct his strabismus which provided him with a great deal of self-esteem later. At the age of sixteen he made his debut against Notts County and won with a 2-1 lead. Matt Busby, Manchester United’s manager, offered £10,000 for Law but Huddersfield turned down the offer. However, in 1960, Law signed with Manchester City at a record breaking transfer fee of £55,000. Law made his debut with the first division team against Leeds United but his goal couldn’t save them from losing the match by 4-3. Later, against Aston Villa, his two goals ensured Manchester City’s win and kept them from being relegated to second division. In 1961 the Italian club, Torino, signed Law for £115,000. Law found it difficult to adapt to the new environment with the Italian football team. On February 7, 1962 Denis was in a car crash with his teammate Joe Baker and received severe injuries. Still struggling at the new team Law put in a transfer request which was denied. Eventually, on July 10, 1962, Manchester United signed him for £115,000. Despite the hardships he had to face in Italy, Denis Law was voted number one foreign player in Italy. In his first match with United he played against West Bromwich Albion and scored the first goal after 7 minutes. The match was a draw. Since after the Munich air disaster the team had lost their spirit and were hustling through the season but they manage to get back up during the FA Cup where law scored a hat trick and helped United win the match by 5-0 against his old club Huddersfield. The team reached the finals and won against Leicester City where Law made the first goal of the match. This was the only FA Cup of his career. Later in a match against West Bromwich the referee, Gilbert Pullin, mocked Denis on field. He was later reported to the Football Association; it was decided that Pullin should be heavily censured. Law was selected in the Rest of the World team that played against England at Wembley in the 1963-64 season, he called it the greatest honor of his career. In 1964-65, Law won the Ballon d’Or award. He also became the first division top scorer that season. In the later season Law suffered a knee injury that caused him problems in the future as well. In 1968, United won their first European Cup but Law’s knee injury was getting worse and he couldn’t play the semifinal and the final for Manchester United. Law couldn’t play the entire 1969-70 season due to his injury. He was put on the transfer market for £60,000 but no one bade for him. In 1973, Law was given a free transfer by Tommy Docherty, United’s manager. Manchester City’s manager, Johnny Hart, offered Denis a contract and he scored two goals in his debut match against Birmingham City. In the 1973-74 season, when City played against United, Denis scored a goal but was sorrowful about it because a loss for United could result in a relegation. The match was abandoned due to pitch invasions. Denis Law appeared for Scotland in the 1974 World Cup then announced his retirement in the same year. In 1961, during Scotland’s match against England, Law didn’t score a single goal for the team and Scotland lost by 9-3. He called it his “blackest day”. In 1963, Law was chosen in the rest of the world team to play against England. In 1965, Law scored a goal in the famous victory over England. In 1974. 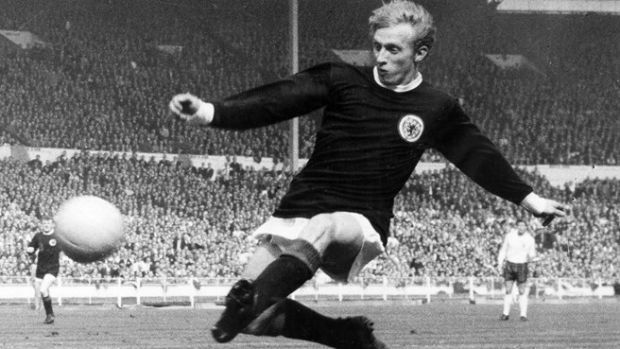 Scotland reached the World Cup finals after 1958 and Denis Law played the first match for Scotland against Zaire. He didn’t play any of the following matches, the match against Zaire was Law’s final appearance with Scotland.